gorgeous! what’s not t love? Indeed! Splendid colours! They make me happy, too. Oh yeah, Anna! I guess yarn is my new pencil crayons. Di, I bet you didn’t know that Vanna is a crocheter! 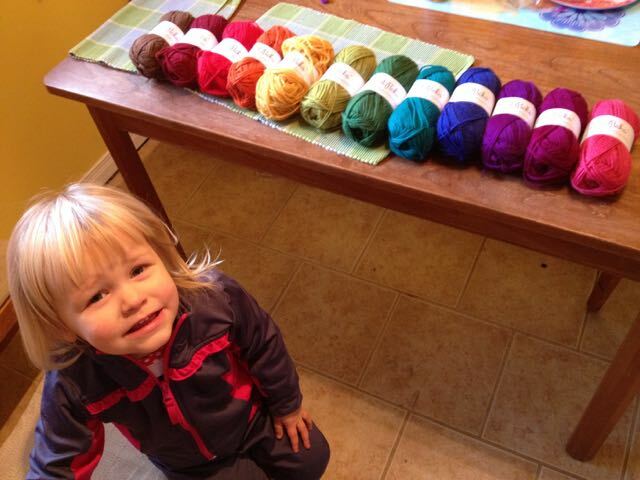 She has her own line of yarns and products. ! When we got home with Ev, I said “go look on the kitchen table” and he said “A rainbow of bofers!” I was pleased he still remembered that from his early days. Then commenced a period of two young people bofing each other and throwing yarn balls around the house.